When old equipment’s fail, they do fail in waves, depending on the failure modes induced by the original design. 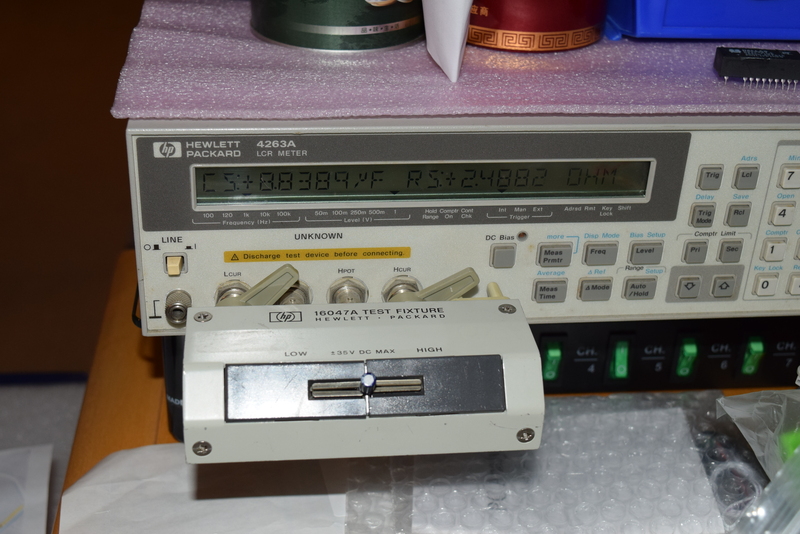 Last week when I turned on a TDS 784A in my inventory check, something smelled bad and the display was garbled (it has displays, but straight lines turned into wiggles). I already replaced the caps for the processor board, keyboard and RS-232/Parallel Port module preventatively and the unit used to work fine. So it boils down to either the power module or the CRT driver. Despite it’s unlikely to be the power module (didn’t feel any fan speed changes, display brightness changes, or hiccups in power), I used my nose to make sure there’s no burnt electrolyte smell from the power module. Indeed there wasn’t. I took them out and cleaned the PCB and noticed that the wipes has a bit of green and black stuff on it. That’s how I can tell a capacitor just peed all over itself. The culprit is C321 and C323. 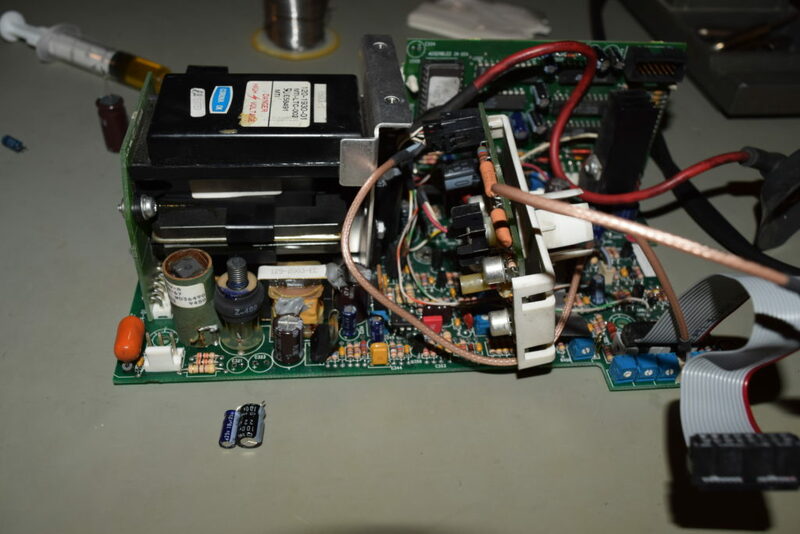 Note that the component layout for this color CRT driver, 678-1402-07 (the board has silkscreen saying 671-2373-389-1344-01) does not match the component locator I have with my TDS 544A schematics. Nonetheless, it’s nearby if you look around. ESR for these two caps should be at the order or milli-Ohms if they were any good. I took the one next to the two offending capacitors out to test it, and the ESR looked OK so I put it back. The true reason is that I don’t have that capacitor value on hand at the time of writing, but that also helps to narrow down the true cause. 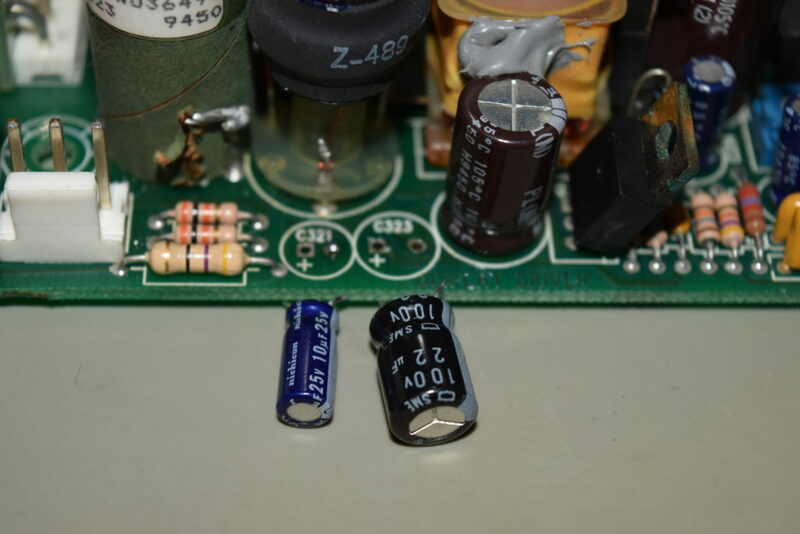 I replaced these two capacitor and the display worked correctly (not garbled). The brightness is a little bit high which can be adjusted down. The next problem is that the shutter color changes out of sync back and forth a slow then fast rate till it gets stable after warming up for a while. I did a lot of troubleshooting, changed a bunch of capacitors and transistors and shutter board, but no avail. In the process, I smelled electrolyte evaporating with the flux and I decided to give the board a full wash with dishwasher detergent and waterpik (then dry the big part with a leaf blower, spray with 99% rubbing alcohol to the water out and left it dry). Bingo! Lessons learned: do not leave the electrolyte leaks on the board even if it’s an old fashioned single-sided through-hole with relatively simple thick traces. I thought it’s not going to matter until I see visible corrosion, but I was wrong. Could it be the electrolytes left on the board forming weakly conductive paths that disappears when the unit warms up (the electrolyte dries up)? In the process of replacing all the electrolytic capacitors on the board, I smelled fumes mixed with electrolytes in some areas (other than the two above). However, I didn’t record it because I measured the ESR for each capacitor that I pulled and compared to the ones I’m about to put in. Nonetheless, the only useful technique that contributed to this board being repaired is finding out where the smell comes from. 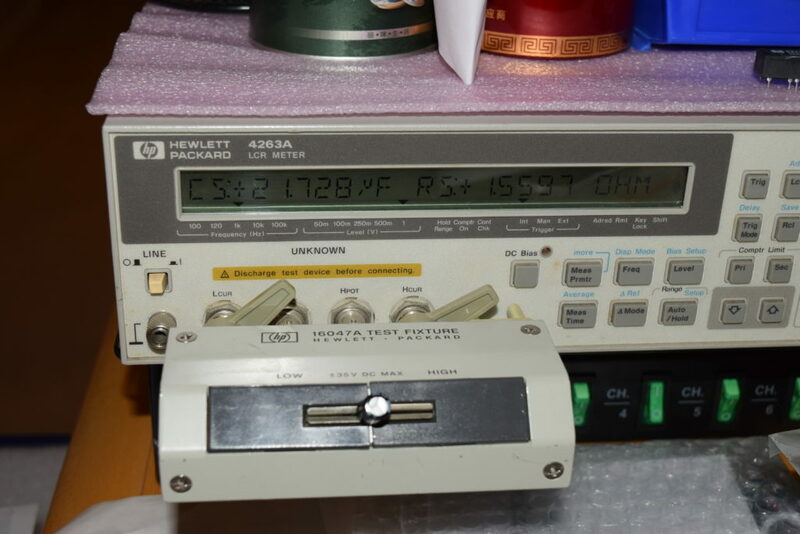 The rest (reading at schematics, measuring voltages, checking waveforms on an oscilloscope, swapping out parts) are all red herrings. In the process of troubleshooting with schematics, I also noticed that the schematic for the old TDS 544A color CRT driver is actually pretty much the same (including component numbering) as this newer board 678-1402-07 while I was troubleshooting with it. Looks like the component layout was slightly shifted to make room a different batch of flyback transformers (there’s a riser board for the flyback transformer in 678-1402-07 used in 754A/784A). Although the component locator sheet isn’t exact, the components are within 1 inch of what’s found in TDS 544A CRT driver’s component locator. No biggie if you don’t have the schematic for the newer color CRT drivers. Just look around and pay attention to the silkscreen. Common sense will lead you to the right part. Previous Post:Onion News on Google Finance!